Cutting the payroll tax on older workers: a tax cut that could pay for itself? Following is an op-ed I had in the Wall Street Journal last week looking at the possibility of cutting the Social Security payroll tax for older workers. I make three main points: first, Social Security provides a very poor return on contributions for workers nearing retirement; second, these near-retirees are far more sensitive to such incentives than middle aged workers; and third, due to this sensitivity, lowering payroll tax rates on older workers could spur labor force participation such that extra collections from non-Social Security taxes could offset much or all of the loss to Social Security’s revenues. 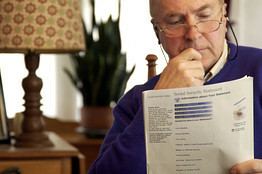 The annual Social Security Trustees Report, released on Monday, confirms that the program is significantly underfunded. After decades of delay, Congress and the next president will need to take steps to restore Social Security's finances and improve Americans' retirement income security. Although it might seem counterintuitive, one positive step toward achieving both goals is to cut the 12.4% payroll tax for workers nearing retirement, say, at age 62. The reason is that the current system encourages too many individuals to retire early, forgoing the extra savings they could have by extending their work lives. It is true that, in the aftermath of the Great Recession, more people are postponing retirement to rebuild their battered 401(k)s. Nevertheless, Americans on average still retire more than two years earlier than they did in 1960, despite less strenuous jobs and significantly longer life spans. The typical worker will spend one-third of his adult life in retirement, financed by entitlement programs that cannot bear the strain. There are many reasons Americans retire young, but Social Security benefit rules unquestionably play a role. A 2009 study I coauthored with David Weaver and Gayle Reznik of the Social Security Administration (for the SSA's Office of Retirement and Disability Policy) found that for each dollar of additional payroll taxes a near-retiree pays into the system, he or she receives only around 2.5 cents in extra lifetime benefits. The returns are meager because Social Security benefits are based upon an individual's highest 35 years of earnings—an additional year of work is unlikely to boost benefits. Second, most female retirees receive a spousal benefit based upon their husbands' earnings, and the spousal benefit is not increased by any additional taxes she may pay. Third, once individuals reach the full retirement age they are ineligible for Social Security disability benefits, but they must nevertheless continue to pay the 1.8% disability payroll tax. Unlike other taxes, the work incentives presented by Social Security are a function of the tax workers pay in a given year minus the future benefits those taxes entitle them to. For younger or low-income workers, this "net tax rate" is low or even negative. For near-retirees, however, little or any new benefits are earned in exchange for taxes paid, making Social Security a clear disincentive to work. How sensitive are near-retirees to changes in after-tax earnings? A 2005 study by Eric French of the Chicago Federal Reserve found that a 10% increase in wages as of age 62 would increase this cohort's labor supply by 18%, and the overall labor supply by 1.1%. In a 2009 study that relied on differences in state income-tax rates, Lucie Schmidt of Williams College and Purvi Sevak of Hunter College found that a 10% increase in after-tax earnings would increase labor force participation by 7.5% among men and 11.4% among women. And in forthcoming research, John Laitner and Dan Silverman of the University of Michigan find that eliminating the payroll tax at age 59 would cause individuals to delay retirement by an average of 1.1 years. Obviously, reducing or even eliminating the payroll tax for older workers would lower Social Security revenues. But increased labor-force participation would raise non-Social Security tax collections. The budgetary question is how these balance out. Using the standard Social Security models developed by the Policy Stimulation Group, I estimate that eliminating the 12.4% payroll tax for workers at age 62 would reduce annual Social Security revenues by roughly 2.2%, or about $16.2 billion in 2012 tax collections. Meanwhile, the gains to individuals and the economy could be substantial. Working one additional year would boost average private pension income by almost 5%. And all Americans would benefit from the extra goods and services that older workers could provide. Cutting the payroll tax on older workers won't pay for itself. But the fact that it would come so close to doing so illustrates the losses we suffer under current policy and the potential gains to individual welfare and the economy. Mr. Biggs is a resident scholar at the American Enterprise Institute and a former principal deputy commissioner of the Social Security Administration. Does it pay to delay Social Security Benefits? New research from John B. Shoven and Sita Nataraj Slavov says, for many people, the answer is yes. The standard response is that the benefits you receive over your lifetime are roughly the same whether you claim at age 62, age 70 or anytime in between. And this may be true on average. For those of you who don’t like the actuarial mumbo-jumbo of the Social Security Trustees Report, public trustee Chuck Blahous has penned a guide to the 2012 report, available over at e21. Worth checking out. The Social Security Trustees released their annual report today on the program’s financial health, predicting a significantly larger funding shortfall than was projected only a few years ago. Most news reports focus on the year when Social Security’s trust fund will be exhausted – today’s Trustees report projects insolvency in 2033, four years earlier than last year’s report. But the key measure is the system’s “actuarial deficit,” which measures funding shortfalls over a full 75-year period. This year, the Trustees project a 75-year shortfall equal to 2.67 percent of the total wage base. That’s around $9.1 trillion in present value dollar terms, meaning that if we set aside $9.1 trillion today, earning interest, we’d have enough to cover full benefits for the next 75 years. Going back only to 2010, the Trustees projected a much smaller actuarial deficit of only 1.92 percent of payroll, equal to $5.9 trillion. So things have gotten a lot worse in a short space of time. There are a lot of reasons for this, but the main drivers include rising disability costs, longer life spans and the effects of recession on tax receipts. The short story is first, that taxes are going to have rise or benefits be cut, and by more than we previously thought; and second, the longer we wait to fix the system the bigger those cuts will have to be. Both President Obama and Gov. Romney should start talking about how they would fix Social Security. Reporting on a new Urban Institute study, U.S. News & World Report notes that the record high benefit claiming rates we saw over the past few years have slowed down. With jobs scarce, many individuals claimed Social Security benefits as soon as they became eligible. However, that trend has now slowed – which makes sense not only because the employment picture has improved somewhat, but also because high claiming rates over the past several years reduced the number of people eligible to retire. Over at EconTalk, MIT Professor David Autor is interviewed by George Mason University economist Russ Roberts regarding Autor’s well-known research on the increase in the Disability Insurance rolls. Check it out here.